Photo courtesy of Home Brew Chef. 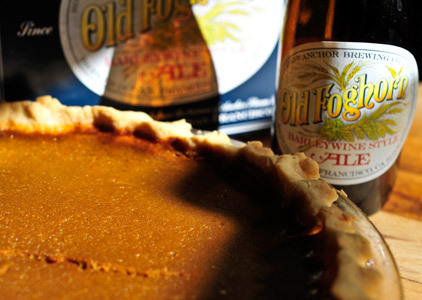 When it comes to the holidays, no table is complete without a fresh pumpkin pie. Add a little Old Foghorn and bourbon to the mix, and you’ve got a perfect pie that is sure to disappear in minutes. “Mixing crème fraîche with an English-style Barleywine that has notes of caramel and hops adds a touch of sweet and sour to the pumpkin, and builds a delicious pie filling,” says Home Brew Chef‘s Sean Z. Paxton, who dreamed up this tasty twist on a fall classic. Add in the Anchor Brewing Co. Old Foghorn Barleywine , crème fraîche (or sour cream) and pumpkin purée, blending until smooth. Pour the filling into the cooled, pre-baked Bourbon Pie Crust, tapping lightly on the counter to remove any bubbles, and place into a preheated 325°F | 163°C oven for 55 – 60 minutes. The filling should be set, but not too firm; a light shake to the pan should have a little wobble to it. Remove from the oven and let cool for at least 2 hours to set properly before serving. In a large pot, add barleywine, maple syrup and malt powder. Place the pot over a medium flame and whisk to dissolve the malt powder. As the syrup comes to a boil, it will foam up; whisk to deflate the bubbles and prevent a boil-over (another reason to use a large pot—for the extra volume). Let the syrup simmer (adjusting the heat) for 15 – 20 minutes, or until a thick consistency is reached and the temperature is 240°F | 116°c. Remove from heat and let cool. Option 1: Slice the cooled pie into eight pieces and place a slice onto a plate, spooning some of the Maple & Malt Caramel-Infused Whipping Cream across the wedge, then drizzle some of the caramel across the plate as a garnish. Repeat with remaining slices. Option 2: To make a Pumpkin Crème Pie, pour the whipped cream on top of the baked and cooled pie surface. Using a spatula, spread the cream evenly across the pie, forming a bit of a hill in the center. Now, using the squeeze bottle, lace the Maple & Malt Caramel back and forth over the pie, creating a pattern. This can be made up to six hours in advance. Slice the pie into eighths, and serve each slice with an extra drizzle of the caramel.